Simply put: it goes bang every time. 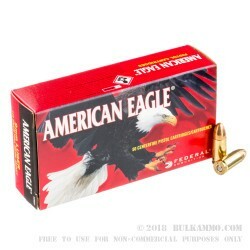 This American Eagle ammunition is a 9mm Luger 115 grain full metal jacket conical bullet cartridge made with fresh brass, and priced at range ammo prices. 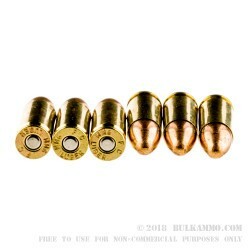 Perhaps it’s the perfect range round for your 9mm needs. This is seemingly nothing special at first glance: a typical 9mm load with a FMJ projectile. But American Eagle 9mm in 155 grain has done well to secure its reputation as the import killer in the world of 9mm range ammunition. The reliability rate, the flawless feeding, the virgin brass and the seriously competitive pricing make this a legitimate choice every single time you go shopping for ammunition. Reliability is something special. Simply put: it goes bang every time. That’s what Federal’s American Eagle has going for it. Offering 1180 feet per second and 355 ft. lbs. 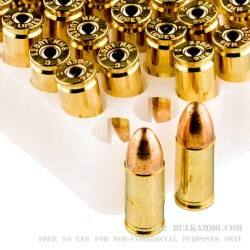 of energy at bore exit, this reloadable, boxer primed brass cased ammunition is great for any day at the range where you need to send bullets down the firing line. Sure it’s simple and reliable, and sometimes that’s the most important thing. Suitable for use in any 9mm firearm. Q: I have an S&W 9mm "Shield". What alternative ammo would you recommend for target practice other than 115gr FMJ. A: Hi Ted, Typically FMJ is what we recommend for target practice. If you'd like something a little heavier, you could try 124 or 147 grain.